High on the list of frustrating things people do because they feel they have to is jeans shopping. Shopping for a pair of comfortable chinos would be easier, but it would not meet that irresistible need to have a stylish well fitting pair of jeans ready to go at a moments notice. If you are like most people, there are several pairs of jeans in your closet that almost never see the light of day. They may have looked right in the store, but at home they just don’t make the cut over the one pair in the closet that actually fits and feels just right. Just about all frustrated shoppers have thoughts on the matter of how to buy the right pair of jeans. Only a few ideas, however, are really worth considering given subtle variations of body types that a pair of jeans needs to fit. Although it is fairly simplistic to say that there are only five body types, it is the easiest way to narrow down the hundreds that could be given. Consider these groupings: short-wasted, long torso, plus-size, wide hips, slim and petite. There are of course variations in between. For a short-waste consider lower fitting hip hugger jeans. These will tend to elongate the upper body. For a long torso body type, go for a pair of jeans that has a defined waist. This goes in the opposite direction of the short waist person. Plus size people need to work with balancing the hips. To do this, look for a flare at the bottom of the leg. This will balance out the hips. Also, large pockets close together will help. 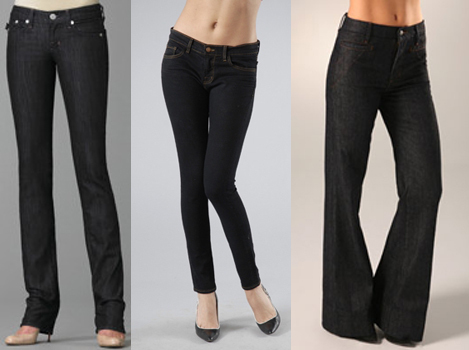 A petite person should consider a straight leg pair of jeans that may be a bit baggier then normal. This will cast a taller silhouette. Unless you look like Goldie Hawn when she was in her 20’s and 30’s certain areas of the body have moved and your attitude has changed. Make yourself understand that the days of the torn knee and low-rise jeans are gone. This is not necessarily a bad thing because it gives you quite a few options with regard to style and fit. The perfect fit means differing things for differing uses. Jeans at a casual party require a differing fit then if you might be wearing them on a casual Friday. Consider a stiffer leg if you are going to a function that isn’t quite a picnic but not a slack sort of function. A straight leg will work for people with a narrow waist or short legs, and if your waste isn’t quite as narrow as it once was go with darker colors. Darker colors cover up a host of body imperfections. If you are still having a difficult time finding just that right pair of jeans to fit your body type don’t fret. As the saying goes, “when in doubt accessorize.” If your hips are still in the way, a good pair of shoes and a few frills on the blouse may help a bit (don’t go crazy on the frills though.) Try matching the jean color to some jewelry. Or, the wide ankle is always a good fall back to distract while continuing to be stylish. One of the biggest errors that people make when jean shopping is to not take along those items that they will have on, or with them, when they are actually wearing the jeans. If you need a defined waist or a distraction take along a belt to make sure it fits and works well with whatever else you may wear with the jeans. Afterall, if they fit well, but don’t necessarily look right, you can always make them look right. When you have finally found a pair of jeans that fit and look stylish make sure that you take care of them. A good pair of jeans that fit is not something to take lightly. Always wash your jeans in cold water and if you want to go to extremes turn them inside out so that they don’t fade. Always hang dry the jeans and, if you are going to make alterations, wash them a few times first just in case they want to shrink.